The generosity of Edmund and Frances Clark and Paul Cadario leaves a legacy that will last another 150 years. For more than 150 years, the beloved University College (UC) building is where generations of students have gathered to learn, discuss and develop lifelong friendships in one of the most iconic spaces on the University of Toronto’s St. George Campus. Now, thanks to the generosity of Edmund and Frances Clark, Paul Cadario, and numerous other alumni and friends, University College is undergoing large-scale renovations that will help revitalize this Toronto landmark, while at the same time burnishing its heritage features and making it vastly more accessible. In addition to the upgrades to the interior spaces, the University College renovations will create a revamped and more inviting quadrangle, to be known as the Clark Quadrangle, and relocate the UC Library to its original location in East Hall. 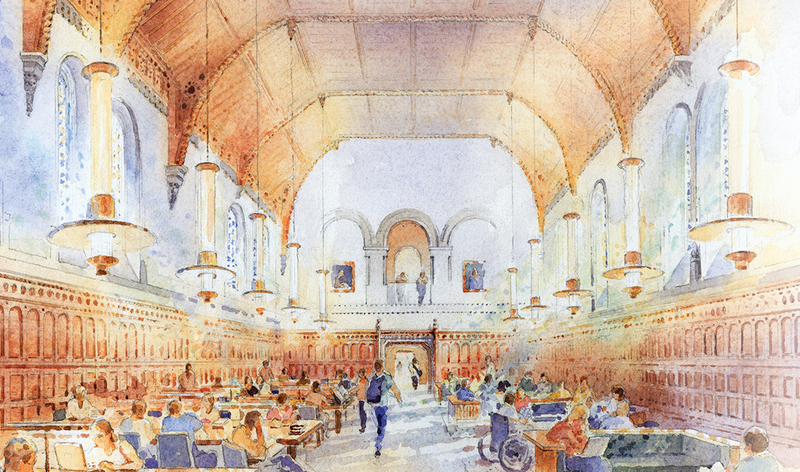 There will also be the Clark Family Reading Room—an updated student space and central gathering point for students—and the Paul Cadario Conference Centre, which will transform the Croft Chapter House into a centre for research, collaboration and scholarly debate. Finally, the revitalization will offer improved accessibility outside and throughout the building, including a new elevator, an accessible front entrance, and the replacement of some stairs with ramps, so future generations of scholars will be able to pass through its doors without restriction. “As past organizer of Fireball, the annual student formal, it’s really nice to know all our students are going to be able to attend our events,” UC fourth-year Environmental Studies student Victoria Kourtis said about the accessibility improvements. Edmund Clark—former CEO of TD Bank Group—and Frances Clark, both 1969 UC grads, come from a multi-generation family of UC alumni. They helped launch the renovation project with a $2.5-million donation in 2013. In 2017, they gave an additional $2.1 million, earmarked for upgrades to the UC quad, matching a similar commitment from UC students. The project also received support through a $3-million donation from Paul Cadario, a 1973 U of T Engineering grad, former member of the Governing Council, former President of the University of Toronto Alumni Association, and a former manager at the World Bank. “This project wouldn’t have been possible without the support of very generous alumni, such as the Clarks and Paul Cadario, and the many, many other alumni who have given gifts of varying sizes,” notes University College Principal Donald Ainslie. These improvements reflect the broader impact of the Boundless campaign at UC, including inside the classrooms. An anonymous donor established the Richard Charles Lee Chair in Chinese Canadian Studies, and James Mossman, a 1981 UC grad, was the lead donor in establishing UC One, a new program to support first-year students as they transition to university life. The Boundless campaign has also supported many scholarships and bursaries at University College that help to ensure that all qualified students can come to UC. The UC revitalization, the curricular innovations, and the new scholarships are just a few examples of the many ways the Boundless campaign has helped preserve U of T’s rich history, while preparing the University to grow and thrive through the next century and beyond.